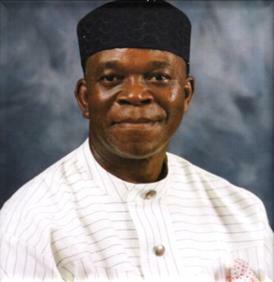 Chief Charles Chukwuemeka Ugwuh is an accomplished engineer, administrator, technocrat and politician, with varied work experience. He has undertaken National, State and Community Service in all sectors of the economic and socio-political life of Nigeria. His educational qualifications, work experience and the immense contributions he has made to the development and growth of the Nigerian economy and society are summarized in this short article. MSc – Master of Science Mechanical Engineering (Thermodynamics), Birmingham University, England, 1972. Advanced Diploma (Technical MBA), Borough Polytechnic (now University of the South Bank), London, 1970. Higher National Diploma, Borough Polytechnic, London, 1969. Ordinary National Diploma and City & Guilds of London in Mechanical Engineering (Government Technical Certificate), Government Technical Institute, Enugu, 1964. Member of the National Political Reform Conference, 2005. He led the six-man delegation of Manufacturers Association of Nigeria to the confab and served on the Economy sub-committee. Member of the Presidential Committee on National Awareness on United Nations Reform. This committee, chaired by former head of state, Abdulsalami Abubakar, is charged with actualizing the initiative to secure a UN Security Council seat for Nigeria. Member of the Presidential Committee for the Revitalization of the Nigerian economy – the highest organ of interaction between the Federal Government and the Organized Private Sector. This committee is charged with determining and recommending economic measures to revitalize the Nigerian economy. Member of Presidential Core Group for CHOGM (Commonwealth Heads of Governments’ Meeting in Nigeria, 2003). This was a special private sector leadership group that handled all the arrangements for the Commonwealth Heads of Governments Meeting in Nigeria in 2003. Member of Core Group, Nigeria Image Project (Nigeria – Heart of Africa Project). An initiative of Government to change the negative image of Nigeria in the international arena. Member, Presidential Committee on Trade Malpractices. This committee is responsible for identifying and tackling all forms of trade malpractices such as trademarks infringement, products faking/counterfeiting and dumping. Member of the Board of Nigeria Customs Service. Actively participating in policy decisions concerned with the efficient management of the Nigeria Customs Service. Member, Independent Consolidation Committee for Cushioning Measures. (A Presidential Committee charged with the responsibility of resolving the crises which followed the increase in the price of petroleum products in 2004). Past President of Manufacturers Association of Nigeria and Coordinating Chairman of the Organized Private Sector. Engr. Ugwuh is a committed promoter of industrial growth and development in Nigeria. His views and contributions to economic debate and action are highly respected all over the country. Founder/Chairman of Rokana Industries Plc, which distinguishes itself in the manufacture of various household products in the plastics and aerosol fields-with product brands which are recognizable and appreciated throughout Nigeria (“Jordan” toothbrushes, Rokana Air-fresheners, Sparkle toothpaste, Natusan Baby Care Products, etc). Founder/Chairman of Hydro Resources Industries Limited, an extractive rural industry based on harnessing natural spring water to produce popular brands of bottled water-UZZI and TROPIX brands of natural spring water. Founder/Chairman of Ebony Agro Industries Ltd (Ebonyi State) and Tara Agro Industries Ltd (Taraba State) – Rice processing companies participating in the Federal Government’s Rice Processing Intervention Scheme. 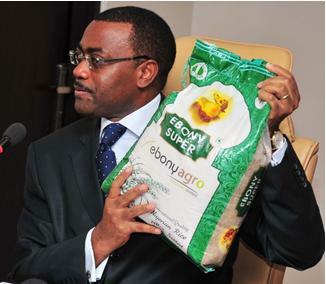 The Honourable Minister of Agriculture and Rural Development, Dr. Akinwumi Adesina, attesting to the quality of Ebony Super rice, a product of Ebony Agro, which Engr Chukwuemeka founded and chairs. Chairman, Imo State Industrialization Committee. 14. Former National Vice-President, Eastern Zone of Manufacturers Association of Nigeria. 15. Former Chairman, Manufacturers Association of Nigeria, Imo/Abia Branch. 17. Former Member, Corporate Affairs Commission, Federal Capital Authority, Abuja. 18. Former Marketing Director, ICI Nigeria Limited (now CAPL), retired in 1981 to set up Rokana Industries Plc. 19. Engineering Trainee, Alvis Engineering, Coventry, UK. 20. Engineering Sales Representative, Shell Nigeria Limited. 21. Technical Officer Grade 1, Government of Eastern Nigeria. 22. Former Director, African Continental Bank Limited, representing Imo State on the ACB Review Board. 23. Former Director, Progress Bank Plc. 24. Former Chairman, Imo Golden Chicken Limited, (An Imo State Government Company). 25. Former Member, Technical Committee on Privatization and Commercialization (TCPC), old Imo State. 26. Former President-General, Amuzi Development Association, Obowo LGA, Imo State. 27. Co-founder, Amuzi Community Bank, Obowo LGA, Imo State. 28. Former Member of PNF, which eventually became the nucleus of Peoples Democratic Party (PDP). 29. Founding Member of Peoples Democratic Party in Imo State. 30. Member of the inner core leadership of PDP and “Think Tank” Group, Imo State. 31. Former PDP Vice-Chairman for Okigwe Zone. 32. PDP Governorship Candidate for Imo State, 2007, until the Supreme Court compelled the Party to withdraw candidature a few days to the governorship elections. •Engr. Charles Chukwuemeka Ugwuh established a secondary school (Amuzi Comprehensive Secondary School) in his village, Umuosinta, Amuzi, Obowo, to provide educational opportunities to the sons and daughters of his community. This institution has a policy of giving priority admission to the handicapped, thus enabling them to acquire education to make them useful to themselves and the society. •Engr. Ugwuh severa viable rural-based industries. The first is Rokana Industries Plc, Nekede, Owerri. Rokana Plc is a distinguished manufacturer of various household products in the plastics and aerosol fields – with product brands which are recognizable and appreciated throughout Nigeria (Jordan toothbrushes, Rokana Airfreshners, Sparkle toothpastes, Natusan Baby Care products, among others). •Hydro Resources Industries Limited, Amuzi, Obowo. This Resources Industries Limited harnesses natural spring water to produce the popular UZZI Natural Spring Water and TROPIX Natural Spring Water. The two industrial investments add value to the economy by producing tangible products for local and export consumption, in addition to providing direct and indirect employment to Nigerians and promoting rural industrialization and development. •Founder/chairman of two Rice processing companies: Ebony Agro Industries Ltd in Ikwo LGA, Ebonyi State, and Tara Agro Industries Ltd in Adani, Enugu State. Both companies are approved participants in the Federal Government Rice Processing Intervention Scheme – a value chain approach towards addressing the critical issue of food security in Nigeria. •He co-founded the Amuzi Community Bank, which is providing rural banking facilities to Ikenazizi community (Amuzi and Alike), in Obowo LGA. Engr. Ugwuh plays a dynamic grassroots leadership role in his community. For several years, he was the President, Amuzi Development Union, during which period several community-based self-help projects were successfully executed. He is still heavily involved in promoting the development of his community, particularly the revival of Oil Palm economy. •Currently, he is the President of Manufacturers Association of Nigeria (MAN) and Coordinating Chairman of the Organized Private Sector (OPS). In these positions, he has diligently promoted the industrial growth and development of Nigeria, through vigorously advocating the empowerment of the private sector and the provision of an enabling business environment. His views and contributions to economic debate and action are highly respected all over the country. •Member of the National Political Reform Conference 2005,where he led a six-man delegation of Manufacturers Association of Nigeria and served on the economy sub-committee. •Member of the Presidential Committee on National Awareness on United Nations Reform. This committee chaired by former President, Alhaji Abdul Salami Abubakar, is charged with actualizing the initiative to secure a UN Security Council seat for Nigeria. •Member of the Presidential Committee for the Revitalization of the Nigerian economy – the highest organ of interaction between the Federal Government and the Organized Private Sector. This committee is charged with determining and recommending economic measure to revitalize the Nigerian economy. •Member of Presidential Core Group for CHOGM (Commonwealth Heads of Governments’ Meeting in Nigeria, 2003). This was a special private sector leadership group that handled all the arrangements for the Commonwealth Heads of Governments Meeting in Nigeria in 2003. •Member of Core Group, Nigeria Image Project (Nigeria – Heart of Africa Project). An initiative of Government to change the negative image of Nigeria in the international arena. •Member, Presidential Committee on Trade Malpractices. This committee is responsible for identifying and tackling all forms of trade malpractices such as trademarks infringement, products faking/counterfeiting and dumping. •Member of the Board of Nigeria Customs Service. Actively participating in policy decisions concerned with the efficient management of the Nigeria Customs Service. •Member Independent Consolidation Committee for Cushioning Measures. (A Presidential Committee charged with the responsibility of resolving the crises, which followed the increase in the price of petroleum products in 2004). •The foregoing achievements provide ample evidence that Engr. (Chief) Charles Chukwuemeka Ugwuh has unstintingly deployed his knowledge, experience, and resources towards patriotic and unwavering service to his community, his state and the nation.